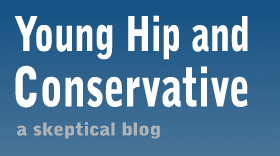 Young, Hip and Conservative: a skeptical blog: Is domestic violence funny? Quite a few people on this hidden camera show think so. So it's out of the way, yes, I have personal experience with this. It causes you to notice things you otherwise would have missed. A few years ago I was flipping through the channels and saw a bit from the show The King of Queens where the wife got a bad haircut and the husband accidentally said something insensitive about it while trying to be nice so she punched him in the arm and he yelped in pain. And the laugh track sounded. There's a slogan that says there is no excuse for domestic violence. Of course, when the victim is a man there are nothing but excuses, and its socially acceptable to make them. Think about this video the next time you see a woman strike a man. It's not empowering or justified, and it certainly isn't funny. Of course domestic abuse isn't funny, empowering or justified! Sometimes, though, people hitting people is funny (in the right context). Who doesn't love a little slapstick regardless of gender? I agree with you Michael! It absolutely isn't funny and I'm glad you wrote about it. The double standard for domestic violence and how we perceive it has always astounded me! I don't mind slapstick either and you've seen plenty of examples of men hitting men, women hitting men and women hitting women where it is amusing - but it's strange that you don't find any slapstick examples of a man hitting a woman. I don't think it's possible. That's true, Jeremy. I'm not sure that I mind that double standard at all, though.